Cellulite seems to be as inevitable as taxes and death. This unsightly dimpling of the skin can occur on almost any body part but it is most troublesome on the legs, thighs and butts. Men rarely have problems with cellulite but women can practically count on this condition to appear at some point in their lives. Even the slender runway models are not immune to cellulite woes. Today you can find hundreds of products that promise to clear the cellulite from your body. Some even claim to make cellulite disappear in just a matter of a few days. With all of these beauty products being marketed to desperate women why do most cellulite remedies fail? There are millions of consumers who will tell you that their cellulite is still present even though they spent big bucks on products that were guaranteed to get rid of it. After using creams, lotions, oils and ointments their mirrors showed that the unattractive cellulite dimples remained as prominent as ever. This is indeed what happens with most cellulite products. You end up wasting time and money and that orange peel skin just refuses to budge from your body. 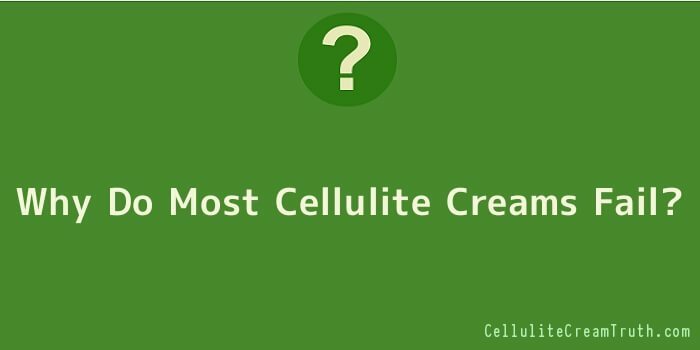 The big question is why do most cellulite creams fail? Is it the product? Is it the ingredients? Could it be the fault of the consumer? The truth of the matter is usually a combination of all of these factors. Now, it’s time to try and set the record straight. There are some products that you can use to help you win the war against cellulite but you need to make sure that you are buying the right one and using it correctly. Many products promise far more than they can actually deliver. This is true of many beauty products aimed at eliminating cellulite. If a product is telling you it can eliminate a problem overnight you should give it a pass because the battle with cellulite is not going to be won in 24 hours. Look for those products that are honest about what the results will be and how long it will take to achieve the maximum results. Reducing cellulite on your body will take anywhere from 4-8 weeks, or sometimes even longer. Ineffective ingredients are a major fault of most products that are designed to reduce and eliminate cellulite. It does not matter how long and complicated the names of the ingredients are because if they are not going to get results then you are going to be disappointed. The two ingredients that have been shown to be effective against cellulite are aminophylline and caffeine. Both of these act as diuretics and help your body eliminate that excess water which can make your cellulite more pronounced. Many people assume that the more they rub and massage cellulite creams into their skin the more effective these products will be. Wrong, again. You have to apply and use these products in the correct manner if you hope to obtain the best results. Most individuals rub their skin too hard which can break down the underlying fibres. Rubbing your skin in a downward motion can also create problems with sagging and hasten the loss of elasticity. Prolonged, deep tissue massage can give an initial impression of smoother skin but this is only an illusion. You have to apply the skin cream the correct way if you want to get the correct results. Gentle, firm strokes in a circular motion are the best way to apply cream or lotion to your body. You only need to apply the cellulite product until it is absorbed into the skin, and using too much lotion will not result in the loss of extra cellulite. Moisturizers are another important factor in any product that is designed to eliminate cellulite. When you are ridding your body of excess water you need moisturizers to combat the possibility of developing dry skin. Moist, smooth skin that is perfectly balanced will help you in your battle to reduce the dimpled look that is caused by cellulite. What you want to do is to find a cellulite treatment that uses effective ingredients and is able to easily penetrate the surface of the skin. The product should have ingredients that target excess water and toxins that are trapped deep below the skin surface. Once it has been absorbed into the underlying tissue it should be able to increase the blood flow to the area where the cellulite is located. This cellulite treatment should also be able to decrease those fat deposits responsible for the dimpling of your skin. Hydration of the skin is also important and any effective cellulite treatment will contain natural ingredients that prevent dehydration from occurring in the skin tissue.